Climate change does not leave anyone indifferent, let alone the real estate in the Florida area, where its effect on localities near the coasts has begun to revalue properties, greatly increasing their prices and causing people with greater purchasing power are interested in them. 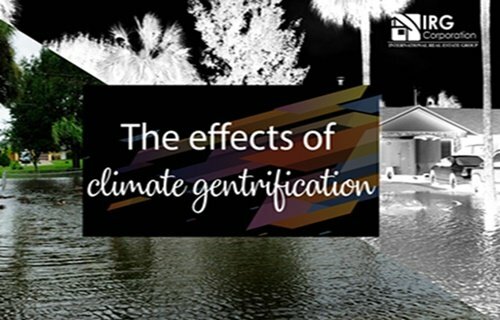 The term that is being used to describe this phenomenon is “Climate gentrification” which means that wealthy people are looking for houses located in high places due to the fear of the constant rise in sea levels due to the different climatic changes that have occurred. has been producing all over the world over the years. One of the consequences that this brings, apart from the fear of losing properties that are located in the places closest to the water, is the increase in large amounts of rents or prices of the houses that are located in the highlands of the cities and As we well know, Florida is a state that is surrounded by the ocean, representing in this way one of the main affected by this problem. The analysis of properties by real estate professionals will change gradually due to the direct influence of these changes and many of the people who seek to acquire a house in these areas that are accessible today could be left without having an opportunity to buy causing that they must go in search of other distant markets. The real estate always suffers constant movements of this style in which negotiations are evolving due to the environment changing in this way the way in which investments will be made over time. Being aware of what is happening and constantly analyzing the projections could give you an idea of ​​what is about to happen in the real estate world in the coming years. Politician and British Prime Minister.